William Branham said that he prophesied in 1933 that women would be given the vote and that through that they would elect the wrong person. He also said that prophecy was fulfilled when John F. Kennedy was elected and the women's vote caused him to be elected. William Branham was anti-suffrage. He openly said women shouldn't vote, or drive. 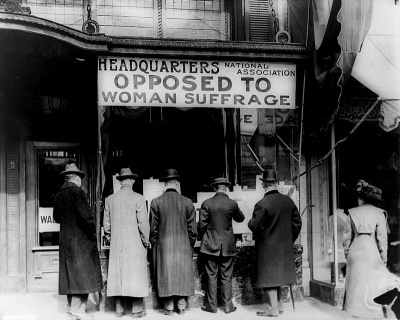 Women were given the right to vote in the Untied States in 1920. Did you know that the majority women's vote in 1960 was not for JFK? Based on the Gallup poll information, it was the men that voted in JFK! While some women did vote for JFK, permitting women to vote did not help JFK get elected. Also, William Branham did not mention that this prophecy - that women would elect the wrong president - until AFTER the 1960 election in which J.K. Kennedy was elected president. There is no mention of this prophecy being in the 1933 prophecies until after the 1960 presidential election. We will be in war with Germany. Watch Russia. (Now, that's...) Communism, Nazism, and Fascism... Watch Russia. But that is not the main one to watch. It shall--also has been an evil thing done in this country; they have permitted women to vote. This is a woman's nation, and she will pollute this nation as Eve did Eden. Now, you see why I'm hammering the way I do. I got, THUS SAITH THE LORD. Also, science will progress, especially in the mechanical world. Automobiles will continue to get like egg shape. Finally they will build one that won't need a steering wheel. (They've got it now.) It will be controlled by some other power. Now, look what happened now. In... President Franklin D. Roosevelt took America to England's tea party. That's right. Germany never picked on us; we picked on them, throwed the whole world into a war, to cause a world war. The Germans built the Maginot Line, which there--any veteran here knows what she took there at the Maginot Line. Women, given the right to vote, elected President-elect Kennedy--with the woman's vote, the wrong man, which will finally be to full control of the Catholic church in the United States; then the bomb comes that explodes her. There's seven things predicted, and five of them has already happened. So you can judge yourself how far away we are. We're near the end. If them five things happened, these other two things are bound to happen. It's just got to happen. Now, and you find out then that women given the rights to vote, and they elected a president that they should not have elected. See? That's that fall. And the face of that, now, we're coming up to this next meeting, coming up. And be prayerful, and pray hard now that God will bless us and will open our understandings, that we might know the hour that we're living. Said, "We now have a president (Dwi... Mr. Roosevelt), and this Mr. Roosevelt will cause the world to go into a world war through his--in his time of his administration, his--his--as president," and then said, "And during this time they have permitted women to vote, which will be a curse to the nation. They'll elect the wrong man sometime." And they did the other day. Now, think of that. Said, "We will go to war with Germany, and Germany will be fortified behind concrete. And we will take an awful beating at this place," the Maginot Line eleven years before it was built. See? Exactly. Look at the prophecy the Lord give me in '33, how it would happen, "They'd permit women to vote; in voting they'd elect the wrong person." Seven things was given; five of them's already happened. The next thing was a great woman, a church, or power or something, to take over in this United States and rule. Then I seen it just like ashes laying, where it come to the end. It was the end time. How many remembers that vision here in the church? Sure. Said that how that even Kennedy would be elected in this last election. How that women would be permitted to vote. How that Roosevelt would take the world to war. How that Mussolini would go towards Ethiopia, his first invasion, and would take it; that'd be the end; he'd die off after that. How these great isms would rise up and all fall back into Communism; Hitlerism, and Mussolini, and Nazism, and so forth, would all fall back into Communism. And eleven years beforehand, it said that we'd go to war with Germany, and Germany would be fortified behind concrete, the Maginot Line. It happened just that way. Said then, after that, would come to a place that--come to pass that science would increase so greatly until they would invent a car, the cars would become more like "egg" all the time. And that vision was told right here where the Church of Christ stands now, at the old orphans home. Charlie Kurn, perhaps in the building tonight, was living at the place at the time. One Sunday morning about seven o'clock it happened. And It said, "Then there would come to pass that they'd invent a car that they didn't need a steering wheel in it; it'd be controlled by some kind of a power." They got it now. They got it now, a magnetic power, radar control. They don't even... Just set your radar to where you're going, it takes you yourself; you don't have to steer it. Now, and it said in there, "At that time, there'd be a great woman stand up in the United States." And she was dressed and beautiful, but she was cruel in heart. And I got a parenthesis on the vision, even yellow paper, said, "perhaps the Catholic church." And the women being permitted to vote would help elect the wrong person for this nation. And that's what they done. Exactly. Now, said, "That would be the beginning." Now, another thing it said, that... Then immediately after that, I saw this nation become as a smolter, just blowed to bits. Now, if them things has happened, so will this other. We're at... That's the reason I'm here tonight trying to bring this and set it to this people at Jeffersonville, 'cause I'm fixing to enter the mission fields pretty soon again, and don't know what time that I may be called away or caught away. I--I... We don't know that. And I want to be sure that I'm--let the church know the hour they're living, 'cause Almighty God will hold me responsible for it. I said, "During that time... Now, they're permitting women to vote; and women, in voting, will finally..." I said, "This nation is a woman's nation; it's marked by a woman. It's a woman right down through prophecy, everywhere; and number thirteen everywhere in prophecy." And I said, "It's a woman's country; she has her liberties here. And she'll ruin it; she's the ruination of the world." Now, so then I said, "There will be in that time, during that time the woman will be permitted to vote, and they'll elect the wrong person (They did it on this last election. That's right.) which will start the stronghold. During that time it'll come to pass that--that there'll be a great woman rise up in the United States; she'll be beautifully dressed (And I got in parenthesis, perhaps the Catholic church. See? ), that'll take rulership over the power, overpower the others in the United States. She'll be beautiful to look at, but she'll be cruel-hearted as she can be." I said, "Then I seen a... They're going to permit women and are permitting women to vote. And by voting, they'll elect the wrong man some of these days." And you did at the last election. It was the woman's votes that elected Kennedy. We know that (See? ), between the crooked machines and things fixed up, that F--FBI exposed. And how could anybody... Why don't they do something about it? Why ain't something said? Ha, afraid somebody'd lose their job. You see, it's just a bunch of politics, rotten to the core. That's all. Sure. Notice. I said, "Mussolini is standing up as a dictator; he will make his first invasion to Ethiopia. But he will take Ethiopia, but he will come to a disgraceful end, him and that woman both." And they hung them with their feet up, and her clothes hanging over her head in the street, and spit on them. I said, "Science will improve." I said, "Another thing, the nation has permitted women to vote, one of the most horrible disgraces they've done." And I said, "In voting they'll elect the wrong man." I'm neither Democrat nor Republican. I'm a Christian. Both sides is rotten. But they made their fatal mistake the other day. Women done the works. And how you colored people, sell your birthright to such a thing as that, when the blood of Abraham Lincoln strain's up yonder on that dress. God have mercy. Help me, Lord. Oh, my. Maybe I shouldn't have said it. But I've done said it. There'll come a worship of a woman in the United States, and that'll be Mary. I seen it, thirty--1931. Seven things happened. I got it right on paper here with me, wrote it in 1931. How that I said, "This President, Franklin D. Roosevelt, he will cause all the world, help do it, send the world to war." Hadn't come to war yet, during times of depression. I said, "Another thing..." And my mother, a square-back Democrat, if she didn't look at me hard when I said that. I said, "I don't care if there's a Republican or if he was a Socialist or whatever he is, this is THUS SAITH THE LORD." And I said, "Doing this, they're permitting women to vote. And when they do that, they done one of the greatest disgraces this nation ever done." And I said, "Someday they'll pay for it." And they did at this last election. That's what elected him: women. I said, "The dictator that's now arising in Italy (which is Mussolini), he will come into power, and he will go to Ethiopia; and Ethiopia will fall at his steps." There's people setting here now that knows that there's a group of people come and stood (when I was having my meeting in the Redman's Hall down there that night, when I had to go down there to preach that, Redman's Hall)--was going to throw me out of the hall for saying such a thing (Here... Yeah, Mrs. Wilson, I know you're... That's right.) when I said that. But did he do it? But I said, "He'll come to a shameful end," and he did. Him and the woman he run with was turned upside down and hung on a rope in the street with their feet up, their clothes hanging down. All right, that come to pass. I've got nothing against women, long as they stay in their place. If God could have give a man anything better, He would have give it to him. "But when she gets out of place, she is water in his blood." Solomon said so. He is the wisest we ever had. But it's women in politics. Didn't, twenty-five years ago, the Lord gave me a vision showing that the women, through permitting to vote, would elect--elect this ricky we got up here now, a modern Ahab setting there with Jezebel turning his neck? And you women fashion yourself after the same way, as she's a model of the world. Five of those things has perfectly been fulfilled exactly. How Mussolini would rise and go to Ethiopia, and fall at his steps; and he would be turned to the people, in shame, with a woman. Many, many years before it happened perfectly on the dot. And it's never failed, and it won't fail, because it's THUS SAITH THE LORD. And it's not contrary to these Bible. It's got to be. This page was last edited on 22 August 2015, at 03:34.